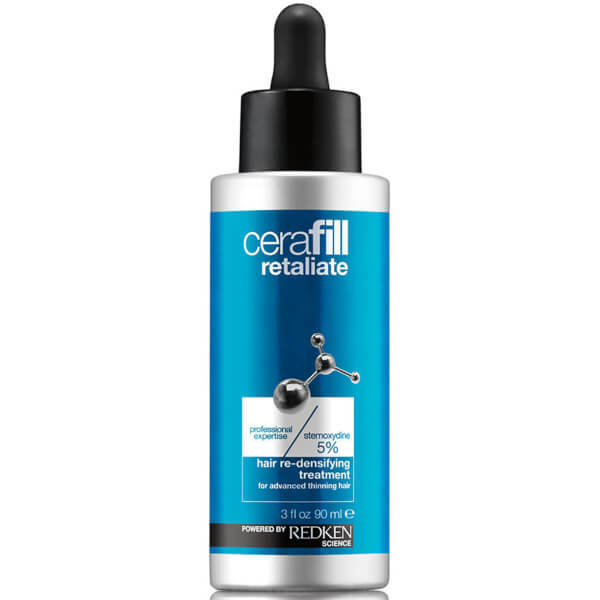 Improve the look of thinning hair with the Cerafill Retaliate Stemoxydine Hair Thickening Treatment from Redken. Powered by 5% Stemoxydine, the energising, re-densifying formula can be applied daily to damp or dry hair; it works to strengthen the hair fibre, whilst nourishing and stimulating the scalp to promote healthy hair growth. Suitable for men and women with advanced signs of thinning, hair feels thicker and fuller with enhanced shine. Features a pipette for convenient application. Apply daily to scalp concentrating on roots. Divide hair into 8 sections focusing on hairline. Position the pipette directly at the root and scalp to apply 1 full pipette of the serum per identified section. Gently massage to permeate the entire scalp and spread along the lengths. DO NOT RINSE. Dry and style as usual.